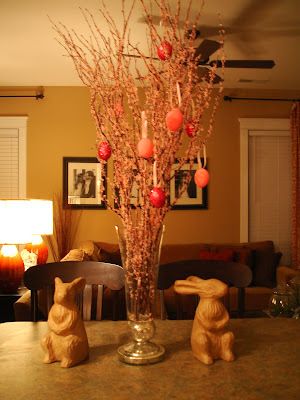 I don't decorate a lot for Easter but I do have a few things I put out. I bought these sticks but you could easily DIY them with some from your backyard, a little spray adhesive, and some tissue paper pieces. 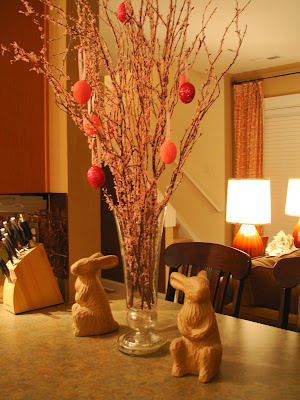 I made the eggs from real eggs and then painted them and glittered some of them. I blew the inside of the eggs out after making a small hole in the top and bottom of the egg. 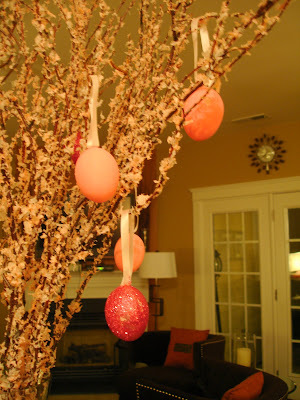 I attached some ribbon so they would hang and now I have a nice "egg tree". The little bunnies are meant to be painted but I kind of like them in their natural state. I may paint them eventually for a change but for now I think they'll stay the way they are!